Brookline has the potential to be a community in which every neighbor has the supports and opportunities needed to thrive. While many impressive efforts are underway to address poverty in Brookline, there is more we can do. The following recommendations draw on the Foundation’s research and interviews with town leaders and nonprofit staff. The gap between Brookline residents who are living comfortably and those who struggle financially is growing. 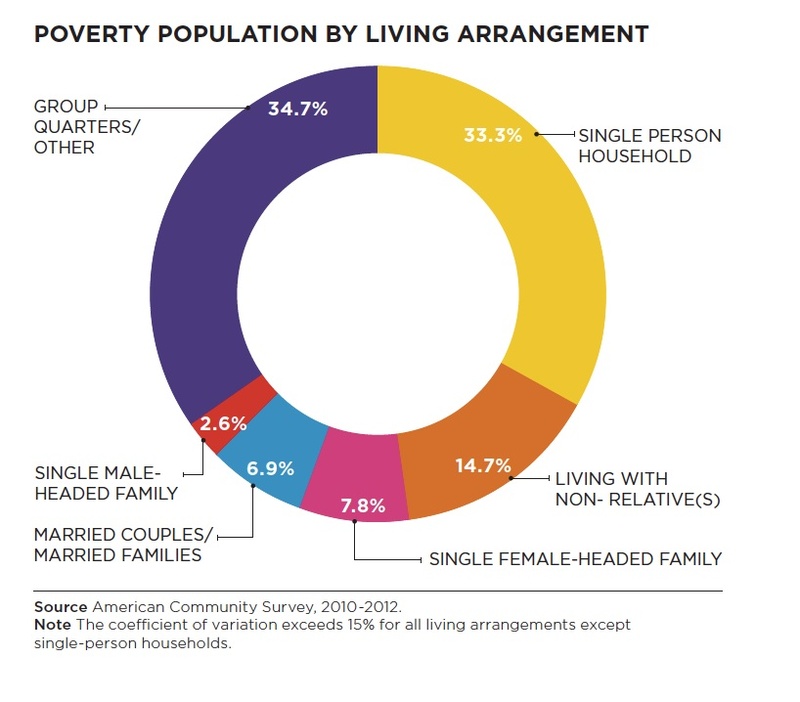 Today, 13.2% of Brookline residents live at or below the federal poverty level. An alarming 29.1% of residents live in households below the 300% poverty threshold, a marker of significant economic insecurity. Meanwhile, Brookline’s top earners are doing better than ever, pushing the town’s average household income up to $154,537 in 2010. Poverty cuts across all age and demographic groups in Brookline with some more affected than others. Poverty varies by gender: 68.1% of those living in poverty are girls and women. 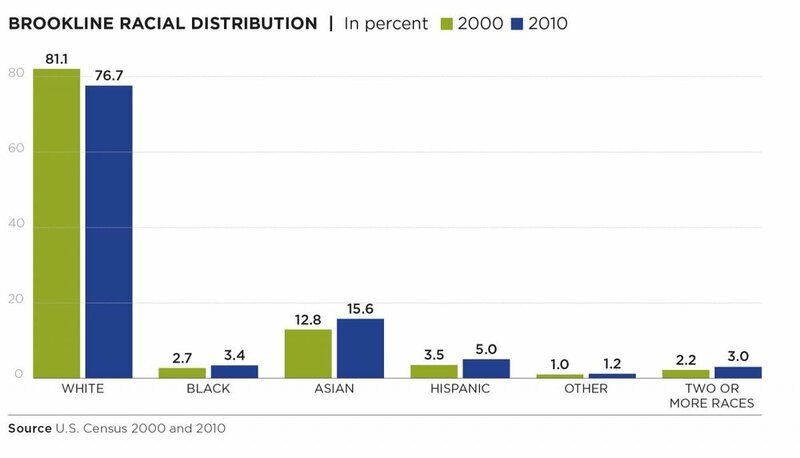 It varies by race: 19.4% of Latino, 13.5% of Asian, 13.1% of black and 11.6% of white residents have income at or below poverty. It varies by education level: 6.9% of adults with at least a Bachelor’s degree live in poverty, compared with 25.8% of adults without a high school diploma. It varies by geography and household type: Poverty households more highly concentrated in the northeast areas of the town and among single people and non-families. Disabled residents are disproportionately affected too: Approximately a third (32.9%) of adults reporting disabilities have income at or below the poverty threshold. Across the state and country, wages have not kept pace with inflation for large segments of the population, making it harder to make ends meet. Brookline’s high cost of housing contributes to the strain, as do the steadily rising costs of childcare and health care. Meanwhile, federal and state assistance programs, intended as a safety net for low-income individuals and families, have not kept pace with inflation. Boston-based Crittenton Women’s Union estimates the true cost of living for Norfolk County to be $76,152 per year for a two-parent family with one pre-school age child and one school-age child, more than three times the official poverty rate. Many Brookline residents are grappling with serious crises, including domestic violence, homelessness, and mental illness that make stability even harder to achieve. Non-profit leaders in Brookline note a need for holistic services to address increasingly complex challenges. To see more research like this, please download our two Understanding Brookline reports. Nearly 59,000 people live in Brookline today. The town experienced a 2.8% population increase from 2000 to 2010, with growth heavily concentrated on both ends of the age spectrum. There was a 21% increase in the number of children aged 9 and younger, and a 40% increase in the number of 55 to 64 year olds. Brookline continues to have a high concentration of 20-34 years olds, who make up 32% of the total population. Brookline residents have unique demographic characteristics, and the population continues to evolve. A female majority: Brookline is 55% female, with females outnumbering males in nearly every age group. Brookline’s unusual gender skew is most significant for 20-29 year olds, who are 62% female. Large and growing professional class: Since 2000, the percentage of individuals in professional occupations increased from 73% to 77% of the total adult workforce. Statewide, only 43% of workers are in this category. Increasing diversity: Brookline is more racially diverse than it was ten years ago, with 23% of residents identifying as a race other than white in 2010. Brookline’s Asian population grew most significantly, increased from 12.8% to 15.6% of the total population. Asian residents include American-born individuals, recent immigrants, and adopted children from with roots in many parts of Asia. An international community: A large internationally born population adds another layer of diversity to our community; 26% of Brookline residents were born outside the United States. Brookline is almost equally split between renter-occupied (51%) and owner-occupied (49%) housing. Both housing types are in high-demand, with just 3.8% of rental units and 1.3% of owner-occupied units vacant in 2010. Residential property values have been relatively resilient through the recession, and rental rates increased well above the rate of inflation. More people in the same space: The average household size grew from 2.18 to 2.27 individuals over the decade, counter to a trend of shrinking households in the region, state, and nation. This shift can be explained by an increase in the number of families in Brookline, a growing average family household size, and fewer singles opting to live alone. Larger share of income: Brookline residents are paying more of their income on housing than they did a decade ago; 49% of renters pay 30% or more of their income on rent, and 34.5% of homeowners spend 30% or more of their income on a mortgage. Affordable housing scarce: Brookline public housing has multi-year waiting lists, and residents with federal and state housing vouchers struggle to find property owners willing to accept these vouchers. Brookline has the potential to be a community in which every neighbor has the supports and opportunities needed to thrive. While many impressive efforts are underway to address poverty in Brookline, there is more we can do. The following recommendations draw on BCF’s research and interviews with town leaders and nonprofit staff. Recommendation 1: Expand emergency supports to meet more short-term needs. Expand summer food resources for children who participate in free and reduced-cost meal programs during the school year. Address barriers to emergency assistance, including language, transportation and stigma. Develop a one-stop approach to needs assessment and program enrollment. Assist eligible residents to enroll in state and federal assistance programs. Raise awareness about local programs that reduce financial hardship. Recommendation 2: Create more pathways out of poverty. Expand adult education, job training and job readiness programming. Develop more programs that empower low-income residents to reach personal and financial goals. Increase wraparound case management services, so residents can access the range of supports they need. Focus on educational equity from an early age, with quality programs that improve the long-term prospects of all Brookline children. Recommendation 3: Tackle systemic barriers to economic sufficiency. Invest in significant expansion of affordable housing. Ensure that all residents have access to affordable mental and physical healthcare. Ensure all individuals and families can access healthy, affordable food. Foster public dialogue and take action to address discrimination that limits opportunities for individuals based on gender, race, socioeconomic background, disability, age, sexual orientation and other factors. BCF’s three-year Brookline Forward campaign is deepening our impact in areas of pressing need, including local efforts to reduce and alleviate local poverty.